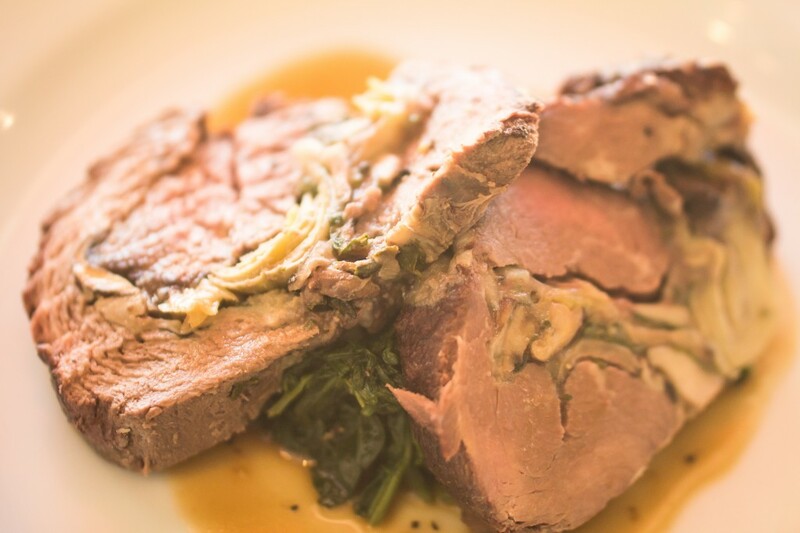 With an upcoming dinner party at the new home of longtime friends, Mike and Debbie, I couldn’t help but think of Mike when preparing today’s stuffed beef tenderloin, since their event gathering will take on a new twist from the past, Mike will be preparing the meal. Yes. My former editor of years ago has taken a recent interest in the kitchen, including, sharing at our occasional lunches together, his latest successes on recipes prepared from Spiced Peach Blog. Well, all except the meat loaf, that is, whose recipe obtained elsewhere, has, according to his wife Debbie, become some sort of an obsession. It is possible I may even get to experience this classic masterpiece at our dining juncture. Now Mike’s new culinary adventures should not be confused with a prior lack of knowledge on good food or, taste even, despite recently confiding his great strides in now understanding the vital importance of seasoning foods in their preparation, like the use of salt and pepper. Mike has always appreciated good food, both at restaurants, and home cooked. 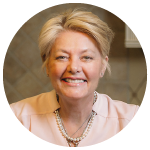 Besides, his wife Debbie, originally from Texas, is quite a good cook to boot, including in the talented preparation of dishes reflecting those flavor influences of the Southwest. And then, there is Mike’s history, having been a former long time newspaper guy, so although this followed working in corporate communications over the course of years, old habits die hard, and without blinking an eye, Mike can still always zip off the current top restaurants in the Philadelphia region and what Craig LaBan, Inquirer restaurant critic is saying about them. I am always assured a fantastic meal whenever Mike chooses the groups dining destination. And, carrying along on those old die hard newspaper habits, Mike can also always be counted on for the immediate passing along of any up to date, interesting, food information, particularly appreciated at moments when one is busily preparing foods, writing recipes, or up to their elbows washing dishes while sulking on having missed Craig LaBan’s Tuesday afternoon Twitter chats. Again. So at this most recent of occasional lunches together, despite the influences of Southwestern flavors that Mike has become accustomed, and in our discussion surrounding the recent meatloaf obsession, there had been no mention of peppers, chipotle sauce, or Mexican style spices, still, I am confident that should this dish appear on the table of occasion, it will, at least, present precisely seasoned with salt and pepper. And this is how I couldn’t help but think about Mike when preparing today’s dish. Well, anticipating fine accomplishment on the first dinner party at the new home of Mike and Debbie, its newest twist, Mike preparing the meal. And then, perhaps, just perhaps, at our next occasional lunch together, Mike shall inform me on another among his smashing dinner party successes with friends, his newest specialty, it’s basic preparation ease, stuffed Beef Tenderloin, Leeks, Mushrooms, Artichokes, perfect, even for the guy taking on some new culinary skills of his own. Preheat oven to 350 degrees. Set butterflied tenderloin on a large cutting board. In a medium size saute pan melt 2 tablespoons butter on very low heat, add leeks and cook until softened, about 4-5 minutes, sprinkle with a couple pinches of salt and pepper, stir, remove from heat and spoon into a large glass bowl. 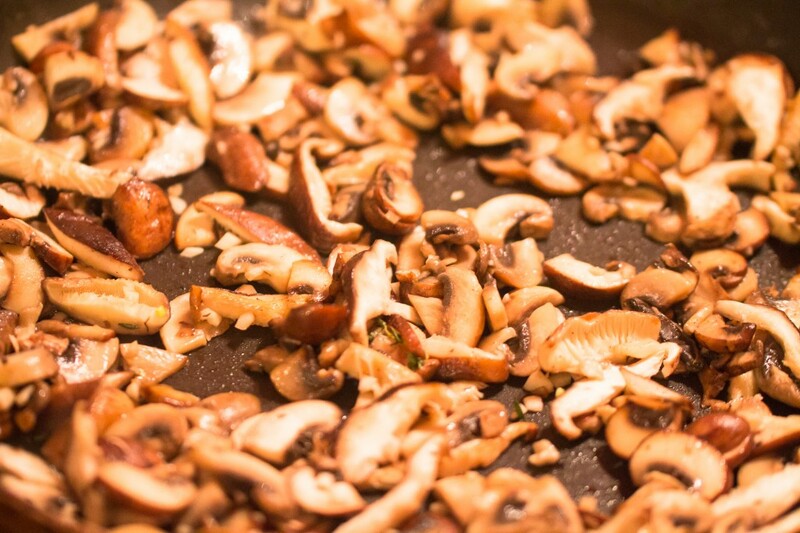 Melt two tablespoons butter in a large saute pan, add mushrooms, stir to prevent mushrooms from crowding and saute mushrooms on medium to medium high heat for three to five minutes until cooked and any moisture of the mushrooms has dissipated. Stir in the garlic, add a couple pinches of salt and pepper, cook for another minute then transfer mushroom mixture to the bowl with the leeks. Add the parsley, grated provolone and Parmesan to the leek and mushroom mixture and gently stir throughout, sprinkling in a bit more salt and pepper again if desired. Once mixture has cooled, spread over the butterflied tenderloin leaving at least an inch border all around. 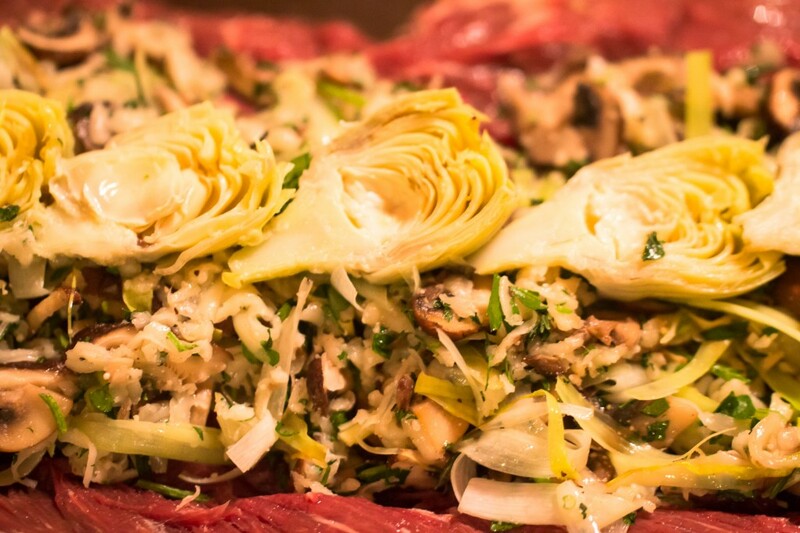 Place the sliced artichokes down the center of the mixture then roll up the stuffed tenderloin using kitchen string to secure the meat lengthwise and around four to five string ties firmly securing the width. Place stuffed tenderloin into a shallow roasting pan, place into oven and cook for around thirty-five minutes. Remove roast from oven, tent immediately with aluminum foil and let rest for at least ten minutes before slicing. Remember, roast will continue to cook further once removed from the oven. Drizzle each plate with sauce positioning the meat halfway on top of the sauce. Reduce the wine in a small saucepan by about three quarter the amount on medium heat, reduce heat to low and stir in the D'Artagnan Duck and Veal Demiglace, season with a couple pinches of salt and pepper and cook around three to four minutes until very hot. Turn off heat then whisk in butter a few bits at a time until incorporated together and smooth, return pan to very, very, low heat if needed to whisk in last bits of butter, taste, check seasoning. Stuffed tenderloin may be prepared early in the day and refrigerated. Leave at room temperature for a half hour before roasting. This entry was posted in Beef, Meats and tagged Beef Tenderloin, Beef Tenderloin leeks mushrooms artichoke stuffed, Beef Tenderloin Leeks Mushrooms Artichokes, Beef Tenderloin Stuffed. Bookmark the permalink. Post a comment or leave a trackback: Trackback URL. The tenderloin looks absolutely delish! I often eat around some of the other things based on personal tastes… but I’d totally dive into the tenderloin! Hi P.J. thanks so much, I really like this stuffed tenderloin a lot, using the same technique you can easily change out the stuffings with varying ingredients, cheeses, peppers, mushrooms, spinach, really, its all in what you like! Thanks for joining in. Oh, I’ll take a few slices of that tenderloin on a cold winter day! Phil recently posted…Trekking into Queens rewards with Kabab Nirvana! Hi Phil! 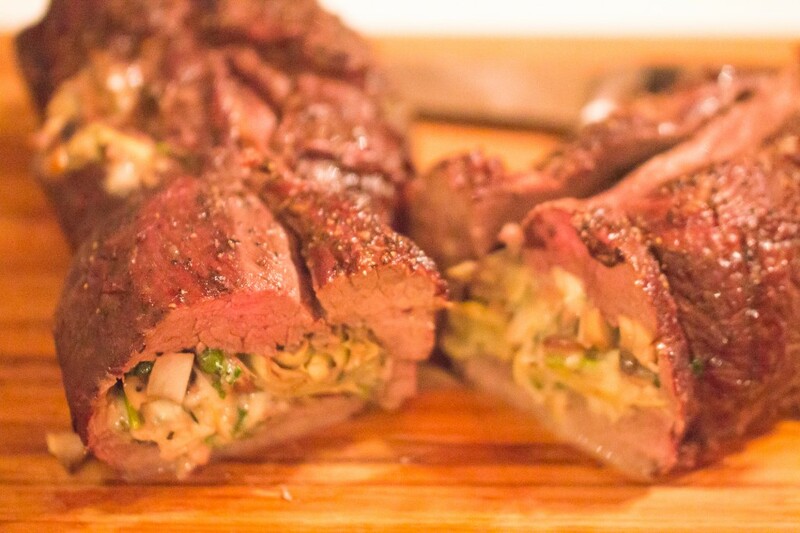 Great to see you, somehow I figured you would really like this stuffed tenderloin, and it is very delicious! Thanks for joining in. Yum! Those look amazing. This is the perfect dish for a dinner party! Hi Tricia, thanks so much. I do love this dish for a dinner party and once tented there is time to heat sides all with relative ease. Delicious looking meal Peggy, my husband would love this! Thanks Cheri! A relatively easy and lovely dish for a dinner party, or even special Sunday dinner! Hope your Mom is feeling OK. This recipe, from a high culinary of art. This food will enhance any holiday table. Thanks so much, it is a lovely dish for sharing with others over the holiday season.